Participants learn how to identify a range of birds, giving them the necessary skills to monitor populations and provide management input and recommendations to land managers. 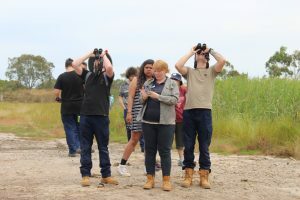 This training program is funded through the Australian Government’s National Landcare Program and is supported by BirdLife Australia, Corangamite CMA and the Department of Land, Water, Environment and Planning. The Shorebird and Wetland Conservation Training Program is normally run in October or November. To be informed when the next training program is happening, sign up for the PPWCMA enewsletter.